Ciara’s engagement ring from rapper Future is an incredible one. Featuring 15 carats of diamonds that add even more glamour to the star’s appearance, the engagement ring was specially designed by celebrity jeweler Avianne & Co. with Future’s help. Like Ciara’s engagement ring, this stunning design from Brilliance features magnificent emerald-cut diamonds for maximum sparkle. Smaller side diamonds flank the center stone, increasing the overall diamond surface to create an incredible visual impact. Born October 25, 1985, Ciara Princess Harris is an American singer, songwriter, dancer, record producer, actress, and model. Born in Austin, Texas, she spent her childhood traveling with her family before eventually moving to Atlanta, Georgia, where she became part of the group Hearsay. 2004 saw Ciara releasing her debut album, Goodies, which contained three hit singles including “1, 2, Step,” “Goodies,” and “Oh.” The album earned her four nominations at the 48th Annual Grammy Awards and was certified Triple Platinum by the Recording Industry Association of America. Ciara’s acting debut occurred in 2006, when she appeared in All You’ve Got. She has earned a number of accolades and awards including three BET Awards, three MOBO Awards, three MVT Video Music Awards, and one Grammy Award. She has sold more than seven million albums worldwide. Did you know that Ciara is the face of the Do Something campaign? She took on the role in 2009 in an effort to help raise school supplies for those in need, and she filmed a public service campaign at the beginning of the effort. Ciara and Future announced their engagement on October 28, 2013, and in January 2014, they announced that they were expecting a child. Ciara gave birth to a son, Future Zahir Wilburn, on May 19, 2014. She and Future called off their engagement on August 13, 2014. What Our Experts Have to Say about Ciara’s Engagement Ring. Thoroughly modern but not lacking in romance, Ciara’s engagement ring by Avianne & Co. contains a total of approximately 15 carats of diamonds. The center stone is a massive eight carages, while the two side diamonds weigh in at approximately 2.5 carats apiece. The ring’s shanks are embellished with smaller emerald cut diamonds that graduate in size from largest to smallest as they progress toward the bottom of the ring. 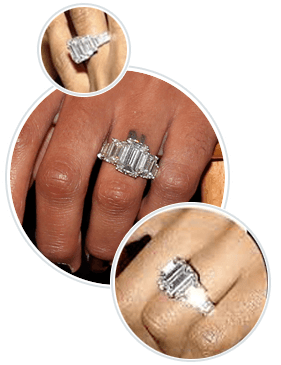 Worth approximately $500,000, Ciara’s engagement ring is one of a kind. Celebrity engagement rings like Ciara’s are so amazing, many people think they’ve got to settle for something much less extraordinary. The truth is that every woman can find a lovely ring to match her personality and style, and to match her budget as well. Brilliance makes it possible by offering a number of solutions including online design tools that allow you to create a custom look that suits your budget. Our diamond experts are with you throughout each part of the process, helping you to create a special engagement ring that is certain to add even more meaning to your love life. Whether you want an engagement ring that’s similar to Ciara’s, or something completely different, turn to Brilliance for beauty that lasts a lifetime. If you haven’t already, check out our collection of Emerald Diamond Engagement Rings for breathtaking engagement rings.